WAUKEGAN, Ill. (WLS) -- Four men were charged in a home invasion that led to a manhunt in north suburban unincorporated Waukegan. Police are searching for a fifth suspect. Lake County Sheriff's deputies responded to a report of a break-in at a home in the 12000-block of Harrison Avenue around 9:50 a.m. Wednesday. The sheriff's office said the caller was able to give a description of the vehicle involved. A deputy spotted the vehicle in Gurnee, on Stearns School Road near Dilley's Road. It pulled into a driveway in the 5300-block of Conifer Lane. Two men ran out of the vehicle and into the subdivision, but officers caught them with the help of a helicopter. Pablo Calix, 19; Javier Montes, 21; Eduardo Solis-Marcelo, 26; and Jose Villegas, 28; were arrested and questioned on Wednesday. A fifth suspect is still at large. Calix, of the 4200-block of Greenleaf Court in Park City; Montes, of the 400-block of Monroe Street in Waukegan; and Solis-Marcelo, of the 1400-block of Cornelia Avenue in Waukegan; were charged with home invasion, residential burglary, unlawful use of a weapon by a gang member and unlawful use of a weapon. Villegas, of the 3300-block of Mobil Boulevard in Park City, was charged with home invasion, residential burglary, unlawful use of a weapon by a gang member and unlawful use of a weapon by a felon. 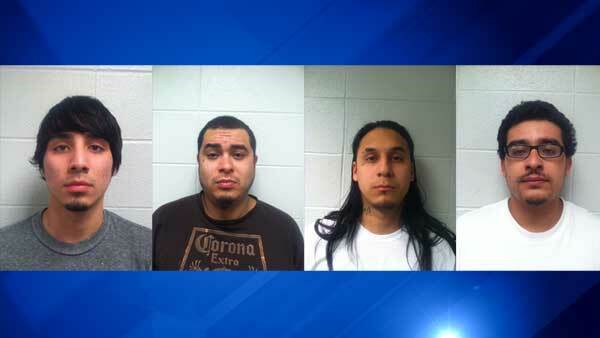 All four men are due in Lake County bond court on Thursday.